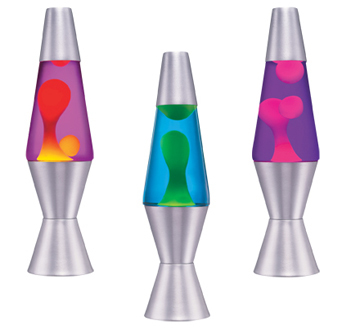 It’s not too late to purchase a lava lamp. Invented in England in 1963, this instantly recognizable home accessory is probably the greatest and most captivating example of kitschy objects. Kitsch is defined as art, objects, or design considered to be in bad taste because of excessive garishness or sentimentality, but sometimes appreciated in an ironic way. What is that stuff moving around in a lava lamp? According to the Oxford dictionary, it contains a viscous (thick) liquid in which a brightly colored waxy substance is suspended, rising and falling in irregular and constantly changing shapes. But I’d rather look at one than read about it. This moving light provided hours of entertainment when it was popularized in the psychedelic sixties. Actually, the word psychedelic associates perfectly with a lava lamp because it visually relates to something with a dense, vivid color or a swirling abstract pattern, like a psychedelic t-shirt. I always wanted a lava lamp.